The new Trodat Professional 4.0. 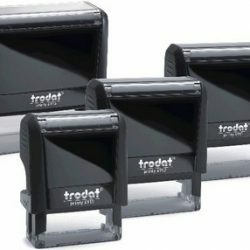 The new Trodat Professional range of Self Inking Stamps has a robust, sturdy casing that provides a worthy frame for numerous new application benefits. The brushed stainless steel construction guarantees greatest possible strength & stability. 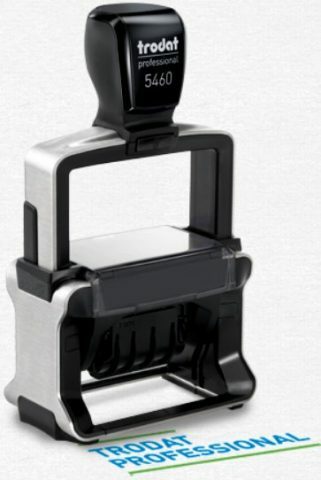 The newly designed finger guard keeps hands clean when changing the ink cartridge & date. The special grip zones on the feet, combined with the slim stamp design provide accurate non-slip application of the stamp. Logos, signatures, line drawings and special fonts from your own artwork can be incorporated at no extra charge. Please email good quality, black & white artwork and specify the size of the final stamped image. Colours or shades of grey are best avoided as they may not come out satisfactorily. We can design new artwork from your sketch or idea. Our rubber stamps are designed for use with endorsing inks or indelible inks specially formulated for rubber stamps. Other inks may damage the rubber.